For the next two months things will be pretty predicable in Destin. We have the snowbirds driving slow in the left lane, locals complaining about them driving slow, sunny and cool or warm and wet weather, and an overall nice slow pace to life. It’s a nice time of the year in Destin. Sunshine Cindy and I got out and about a few times this past week. Thursday night we went to Mimmo’s for dinner. Mimmo’s is an Italian restaurant with excellent food. Mimmo was born in Sicily and uses recipes from his homeland. We actually got a chance to chat with Mimmo for a while. He is a young guy but he runs a fine restaurant. Sunshine Cindy had pasta carbonara and I had chicken parmigiana. Both dishes were excellent. Check it out if you are looking for good Italian food. 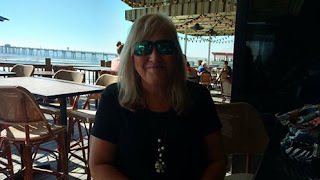 Friday we had to go to Fort Walton Beach for an appointment with our eye doctor. After the visit it was noon so we decided to stop at Anglers on the island for some lunch. We have not been to Anglers in a year or so. We walked in and no one was around. The bar was empty and no bartender was in sight. We didn’t even see anyone in the dining room although I suspect there had to be some folks on the deck area. We waited for a few minutes then decided to leave when no one showed up. Rockin Taco is a newer place that opened last year on the Boardwalk. We headed there to check it out. We are glad we did. This is where Howling at the Moon used to be. The new owners put in over $1.8M in renovations into the place. It is open, airy and right on the beach. Sunshine Cindy and I sat at the bar outside as it was about 75 degrees and beautiful. The bartender was Tad who we remember from TGIFriday’s in Destin. Then I saw Roy who also used to work there. He is a manager here. Finally we saw the GM. It was JP who we have known for several years. We worked with him doing events at Anglers years ago. He came by and we talked for a long while catching up. We had a fun time there. We shared some food and soaked up the sunshine. But we had to head home to take Chaos to her one year checkup. She is in perfect health although she was not happy about the shots she got. But Chaos is a trooper and did fine. Friday night Sunshine Cindy decided to stay home but I went to the Parrot Head meeting at Landshark’s. Jan was playing for us. It was a fun time but I was tired and headed home a little early. Saturday afternoon Sunshine Cindy and I wanted to see the Falcons game so we went to Landshark to watch it. A good crowd was there for the game. We enjoyed some brews, pizza and wings as the Falcons beat the Seahawks. Paige took good care of us. While there we talked to Glen and Bruce who stopped in. Brian and Sue were preparing for a big crowd for the Sunday Packers game. They had more tables brought in to handle the crowd they were expecting. We planned to go out to watch some of the Packers game on Sunday but Sunshine Cindy got into some spring cleaning around the house and didn’t want to leave. I decided that I would go get us some food and headed to Hogs Breath. I watched the first half of the game then got a to-go order. The bars at Hogs were pretty busy with folks watching the game. I saw some pictures from Landsharks and they were packed. With the Packers winning that means next week they will be busy again! Good for them. Around Destin it was announced the Destin Diner is getting new owners. It will now become a Mary’s Kitchen. There is one in Fort Walton but we have never been there. I hear they have good food so we will have to give it a try when they open. The Waffle House in Destin by Airport Road is undergoing a complete renovation. They tore it down to some studs and it is being rebuilt. The place leaked a lot when it rained so it was overdue. We also heard the old Friday’s in Destin will be home to Panera’s as they move from the Commons. In HarborWalk Village a new Italian restaurant is open above Crab Island Cantina. This is where La Famiglia used to be located at. (The La Famiglia in the Commons is still open.) The new place will be called Bella Sera and is co-owned by David Seering. David is a piano player that will bring his music to his new place. On the island Pandora’s is closing. Pandora’s has been around for many years. The owner died last year and his children are running the place but they have decided to do other things. It sounds like a new restaurant or two might be opened on the island by them. This Saturday is the Mardi Gras parade on the island. Come out and let the good times roll!!! I will have a full recap next Monday!